Fabric, lace, wood, formed plastic sheeting, trims and beads. artificial moss, swarovski crystals and flocking. acrylic sheeting, artificial moss, swarovski crystals and flocking. abaca paper, lenticular photos, beads, paint, flocking, swarovski crystals and table. moss, swarovski crystals and flocking. 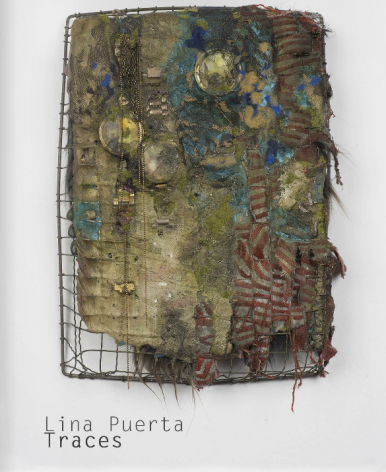 NEW YORK, NY (2015) – Jack and Dolly Geary are pleased to announce an exhibition featuring sculptural works by Lina Puerta, an extension of her recent show at Materials for the Arts where she was Artist-in-Residence during the Fall, 2014. The exhibition will be on view February 27 through April 4 at 185 Varick Street, NY, with an opening reception on Thursday, February 26 from 6-8 p.m. Lina Puerta is a Colombian-American artist who has an ongoing rapport with the cyclical evolution of natural systems and is fascinated by the analogous relationships she sees between humans and the worlds they inhabit. Puerta uses an array of found objects and recycled materials that are carefully chosen for the textures and colors that she considers key to informing her process. Some works are like diminutive ecosystems, uncanny though lyrical. Her wall-works, however, appear as fragments of much larger landscapes in which the scumbled and peeling surfaces are heavily layered with lace, beads, and moss among a variety of other elements, a treatment that implies the temporal-based process of slow accumulation. Regardless of the format, the context of the gallery space highlights the delicate organic quality of her artworks having them seem like evocative souvenirs plucked from an unknown locale. Puerta's most recent work focuses on the process of aging and decay in nature, and in the generative force that also allows for an accretion of new types of growth over time. "Nature is so omnipresent and magical," says Puerta. "Nature is the body and vice versa. What we do to nature, we do to ourselves." Lina Puerta’s work has been exhibited at the Museum of Biblical Art, NY, NY;; Wave Hill, Bronx, NY;; Washington Projects for the Arts, Washington, D.C.;; El Museo del Barrio, NY, NY;; Kunsthalle Projects, Brooklyn, NY;; Praxis International Gallery, NY, NY;; Socrates Sculpture Park, LIC, NY, and Opalka Gallery at the Sage Colleges in Albany, NY. She is the recipient of several fellowships and residencies including Smack Mellon (2013-14);; Wave Hill (2013);; Socrates Sculpture Park (2010);; and Materials for the Arts (2014). Puerta is currently a Keyholder Artist in residence at the Lower East Side Printshop, NY, and this coming fall at the John Michael Kohler, Arts/Industry program in Sheboygan, WI. We would like to express our appreciation to Materials for the Arts for their spirit of collaboration in organizing this exhibition. Curator at the Museo del Barrio, Rocio Aranda-Alvarado, and Yale Doctoral Candidate, Maibritt Borgen, in conversation with Line Puerta about Puerta's exhibition, Traces.